The European record of Synthetic Aperture Radar (SAR) observations over land surfaces, started with the launch of the European Remote Sensing satellite ERS-1 in 1991. Since then, the continuity of the SAR acquisitions was ensured with the subsequent ERS-2 and ENVISAT missions, providing a long European record of C-band observations, which is expected to be enriched with the launch of Sentinel-1. This unique archive offers opportunities for in depth understanding and exploitation of the C-band backscattering over land surfaces. In the past, few studies focused on the use of multi-temporal SAR data for the discrimination of specific land classes, while others concentrated on the fusion between optical and SAR data. Our study regards the discrimination of land cover classes based on the analysis of hyper-temporal C-band VV backscatter trajectories, which are obtained from ERS-1, -2 SAR and ENVISAT ASAR data over a period of 18 years. We discuss the main challenges which limit the use of multi-sensor SAR hyper-temporal series, as issues relevant with the processing of the SAR data (inter-calibration, topographic effects, speckle etc.) and other issues relevant with the specific time-variant conditions which affect the backscatter of various land cover classes. The 18-years trajectories which are obtained on a Mediterranean environment, in the broader Athens (Greece) metropolitan region, indicate characteristic behavior among well-defined land cover classes. The discrimination of the temporal backscattering signature among pure urban areas and water bodies seems to be quite robust, while for vegetated surfaces (forests, shrublands, grasslands etc. ), due to the complexity of the area, was proven more challenging. Finally, a comprehensive framework for the analysis and exploitation of the SAR hyper-temporal time series to improve land cover definition, classification and change detection is provided. 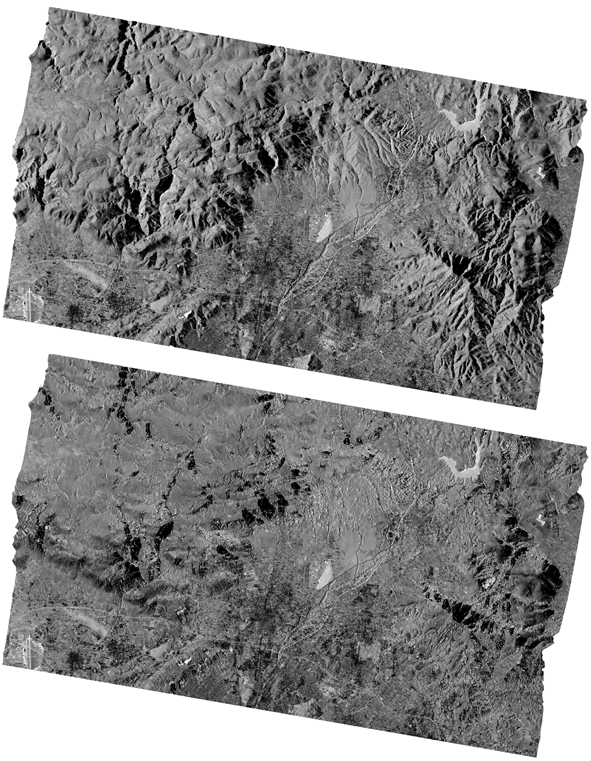 The average backscattering of the study area over the period of 18 years, before (up) and after (down) topographic correction.